The nutritional profile isn’t enough anymore. Consumers want to know everything about the supply chain – environmental stewardship, ethical labor practices, carbon footprint how a product is made. That’s what I call a rabid tribe. That’s why there’s talk about a new “Process Label” As food production and consumption has become more complex, consumers have driven demand for food certifications. We have organic, GMO Free, Gluten Free, Cruelty Free and the list of 626 types of food certification labels goes on. You don’t need a scorecard, you need an app. Consumers may not always know what’s in their best interest when it comes to convenience eating, but there are certainly enough of them to make traditional food brands like Campbell’s crumble and reorganize. They and other processed food giants are finding it increasingly difficult to source new supply chains or retool processes to match the speed and depth of consumer self and planetary interests. Steve Armstrong takes us on a deep dive into the morass of complexities confronting producers, regulators and consumers. Caveat Emptor! 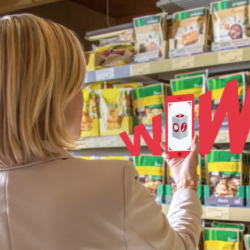 According a new report from Label Insight and the Food Marketing Institute (FMI), grocery shoppers exhibit loyalty to products that create deeper relationships through information exchange,. The Transparency Imperative report found that shoppers increasingly demand transparency and a closer connection to their food, so much so that 75% are more likely to switch to a brand that provides more in-depth product information, beyond what’s provided on the physical label. When shoppers were asked the same question in 2016 in a similar study by Label Insight, just 39% agreed they would switch brands. The vast majority of consumers (69%) said it is extremely important or important that brands and manufacturers provide detailed information such as what is in their food and how it is made.